After journalist Andrey Schkolni leaves his job at The Leninist, the state-supported – and state-censored – regional paper in Uljanovsk, Russia, he and his wife, Marina, decide to start their own newspaper. The couple takes on local apathy, isolationism, criticism, and ridicule; they are determined to serve the local population, located over 550 miles from Moscow in a largely rural, often snowbound area. Week after week, everything from writing and researching the articles to designing the layout takes place in their small home. They even work to distribute the paper – which they name Our Newspaper– with their tiny family car. 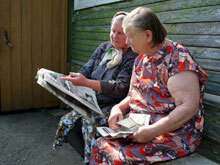 Slowly Andrey's doggedly reported local news and Marina's horoscopes and home remedies begin to catch on. When Our Newspaper's circulation and size climbs to 7,000 weekly readers and eight pages, it begins to pose real competition to the four-page Leninist. Finally, the isolated population can read their own news: instead of "articles" about far-off cities, golden harvests, and unrealizable state projects, Our Newspaper reports on an impoverished village without running water for three months and profiles a courageous local doctor who makes house calls her bicycle despite freezing temperatures. Andrey and Marina's light-hearted local news gathering quickly gathers gravity, however ... until it eventually puts its creators in danger. The issues facing the once prosperous but now economically depressed region are very serious. Despite his best efforts to protect himself and his wife, Andrey's reporting begins to implicate corrupt local corporations and political officials and raise thorny questions of journalistic and business ethics. Juxtaposing small, personal stories against the background of contemporary Russian history, OUR NEWSPAPER creates a portrait of personal integrity and bravery under increasingly desperate circumstances. The award-winning Dutch director Eline Flipse (Broken Silence, Albanian Stories) paints subtle portraits of her film's powerful personalities with warmth, humor and complexity that will stay with you long after the film ends; it is an unforgettable illustration of modern Russia and the vital role of journalism in an emerging democracy.